What are Frivols? They’re a series of collectible tins. They’re a new Moda precut. 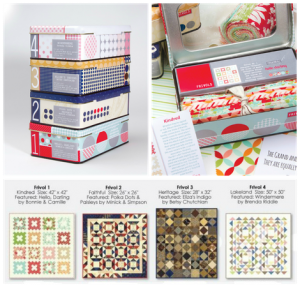 They’re quilts. They’re about having fun! 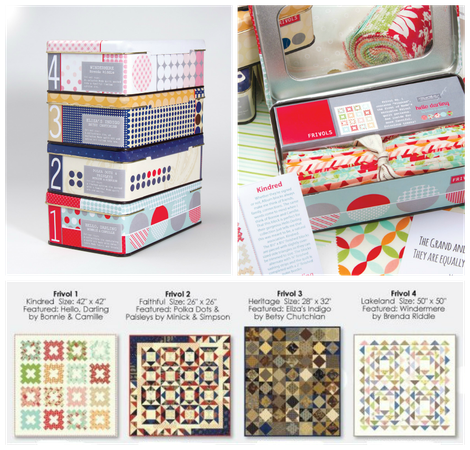 Each tin measures 4.5” x 7.5” and includes 42 7” squares, a new Moda quilt pattern, a new block pattern and a Frivol surprise. Sign up for the Frivols Club by contacting Penny. This is twelve month club and ends in July 2016. Please check back later for more collections.